NAUI NTEC is one of the most underrated class/workshop programs out there. 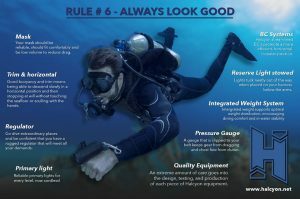 Its a perfect introduction to modern and progressive diving techniques as well as knowledge for divers looking to start their journey down a path of better diving techniques, buoyancy, trim, propulsion techniques, team diving and equipment streamlining. Diving is something that is always evolving, improving and changing through new technology, training and experiences. The concepts we implement and the way we think of posture, trim and technique gets taken to a new level of excellence as the average recreational diver has typically not been taught anything about trim, posture, streamlining themselves in water, or simplifying the equipment configuration. NTEC introduces divers to streamlining gear for example how to clean up your existing equipment configuration, re-routing hoses that are too long or too short, as well as providing the diver with knowledge as to why this gear needs to be reconfigured or streamlined. With NTEC, we utilize the use of a longer primary regulator hose, which is given in an out of air emergency to the out of air diver, while retaining the alternate air source quickly and easily because its located on a necklace around your neck. Through additional streamlining we start removing all the “danglies” off the divers equipment, thus creating a sleeker, more efficient diver profile. The “Traditional” equipment configuration that is commonly used in diving has become dated and obsolete and needs revision, this is where the NAUI Technical Equipment Configuration has truly become “Today’s Equipment Configuration” for divers of all skill level from Open Water to Technical, Extreme Exposure Trimix, DPV, and Cave Diver. It really is a multi-purpose, uniformed way to dive. NAUI NTEC (NAUI TECHNICAL EQUIPMENT CONFIGURATION) is A Modern Equipment Configuration and Introductory Course for the diver who wants the benefit of utilizing today’s most modern equipment configuration. Everyone should take this mini course. This program is a mini workshop/experience program that outlines the benefits of diving with a more streamlined, simple, safe and comfortable equipment configuration. It is a hands on opportunity for recreational divers to rig their gear using the most modern method of diving equipment configuration. We are currently offering NTEC Seminars on a regular basis, check out the Events section of our website for the most current dates. The NAUI NTEC Experience Program is a hands on classroom and equipment rigging session that allows the diver the opportunity to rig their equipment under the direct supervision of our NAUI Tec Instructor, followed by a Pool Session where skills will be demonstrated and students will have an opportunity to preview and work on these rudimentary skills. While at the pool, you’ll learn the benefits of proper diving techniques, fin techniques, improved knowledge on trim and buoyancy, while shedding massive amounts of excess weight, bulk and drag versus a traditional equipment setup. Can be an add-on to Open Water Diver and included with our amazing NAUI Intro to Tech program. Next Seminar: Pick a date and we’ll set it up for you or your group. Available for groups or clubs out of town as well, we’ll come to you. Want to know more about NTEC Workshop – Modern Equipment Configuration & Foundational Skills?